It cannot be proved that William Cowper was prophesying about the 2018 FIFA World Cup when he published The Task and Other Poems in 1785, his moralistic poems that preach humility over pride, but the oft-misquoted verse describes the statistics of the 2018 winners France aptly – as extremes of strategy did not prove successful this time out. Statistically speaking France were a varied team. The 2018 FIFA World Cup Technical Report shows that France were average across all positional, passing, possession and territorial data. The variation of their front three and use of Olivier Giroud, typically a target man, Antoine Griezmann, a nuanced second striker, and Kylian Mbappe and Ousmane Dembele, both lightning quick and skilful wingers, allowed them to change system depending on the context of the game. Whilst their style of play was to get the ball quickly in to the opponent’s half, how they did it and what they did when they got there was often more loosely defined. 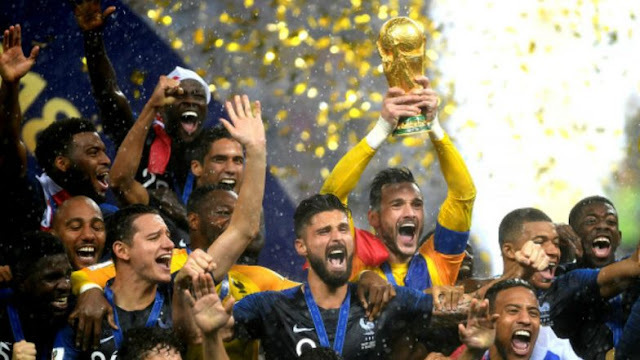 “Playing out from the back” is an in-vogue term linked to successful teams, so how did France fair in their goalkeeper data? Hugo Lloris fell centrally across average goalkeeper depth, both in and out of possession and distribution. The 41 goalkeepers averaged 41 passes per game. Lloris? 41 passes. To exemplify this, Steve Mandanda, the French backup goalkeeper, played one game and his total was also 41 passes. Across short, medium and long distance passes combined, the French goalkeepers straddled the average, with Lloris slightly below and Mandanda slightly above. Yet more evidence of a varied playing style. France fell around the average mark for final third entries, penalty area entries and penetrative passes, but two areas that stand out as being exceptionally good in comparison to the average are shooting and distances covered. France, at six shots per goal, were ruthlessly efficient – only Russia fared better. In every shooting statistic, France came out near the top. Clearly goals still win games. Interestingly France did not appear to tire themselves out with endless running, averaging the fifth lowest overall distance covered and the seventh lowest for distances covered at a speed of more than 20km/h. Coupled with France’s ruthless efficiency in front of goal, they seemed happy to take the lead in every game before countering their opponent’s response to going behind. France were behind for only ten minutes in total across seven matches. This is not by chance; they clearly had a strategy for managing the game. In club football, clear philosophical approaches are successful; from Manchester United’s wicked wing play under Sir Alex Ferguson, Jose Mourinho’s ‘fewest mistakes wins’ strategy of the mid 00s or Pep Guardiola’s take on tiki-taka. Yet international tournament football is generally a more guarded affair, where short bursts of unpredictability can offer the highest rewards. So perhaps William Cowper was on to something. In World Cup football, variety is the spice of life.